So, earlier this week SixthSense (YouGov’s market intelligence platform) released figures from its recent research – it suggested that 81% of students watched TV online. And for some reason we were surprised. Other figures from a Lightspeed survey showed that 58% of respondents had streamed or downloaded TV within the last six months. It was this figure that I found surprising – I thought it’d be much higher. Most of the TV I watch at home comes over the web – either streamed or downloaded. It’s far more convenient. Never in my flat do I hear the complaint that there’s nothing on, and that’s because we’re not reliant on a broadcaster’s schedule. We watch what we want, when we want. At the moment I plug my netbook into my TV to play this content, but more and more tellies are becoming web-enabled for a richer experience. At a digital entertainment debate I attended recently, one expert predicted that within ten years 75% of TVs would be internet ready. However, using the web from ten feet will be very different to the web from two feet. YouTube is a huge repository for web videos, but entering search terms through a remote control every 15 minutes isn’t going to be much fun. It’ll be the likes of catch up TV services, such as the BBC iPlayer and ITV Player, that’ll initially help stimulate the uptake, and also services that offer feature length films, such as LOVEFiLM or Sky’s Anytime+ service. But the benefit of plugging a set into the web is not just its on demand video content. There’ll also be a social networking slant and some very useful online apps. Imagine you’re feeling peckish when watching football with friends. With web TV you’ll be able to open a TV-based app from Domino’s Pizza and browse through the menu on-screen before placing your order. And then, if the game looks destined to be a dull scoreless-draw, you might want to access the biography of a manager or watch goals from the previous season. And if football’s not your thing, film buffs will be able to access on-screen reviews from IMDB. And if you stumble upon a new actor or director you like, you’ll be able to watch their other films in a matter of seconds. Of course, broadband speeds will have to increase if this service is going to fulfil its potential, and manufacturers will have to develop slick interfaces so we can access broadband and broadcast channels indiscriminately. But in the not too distant future internet TVs will supplement our viewing experience and go well beyond what Teletext and Ceefax even aspired to become. 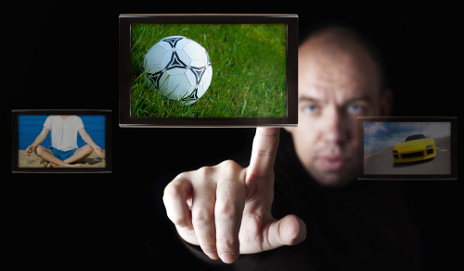 Is media multitasking turning our brains to mush? It sounds marvellous, but “broadband speeds will have to increase for the service to fulfil its potential” hits the nail on the head. As Which says in another article, “UK broadband is still in the slow lane”. Are we trying to run before we can walk? When I got my Panasonic G10 TV attached to FreeSat I thought that I would be able to view BBC Iplayer. How wrong I was! The Iplayer service requires both a satellite connection AND broadband. This does not seem to be highlighted in reviews and no logical explanation as to why both sat & bb are required was never offered by FreeSat or BBC. Anyway I’ve cabled up my router and Iplayer works. Now I’m waiting for the service to be delivered to the Panasonic Blu Ray player – I can get my Picasa photos on the player – so why not Iplayer? Perhaps I should just wait for Project Canvas aka YouView. I’ve just checked the W?OL report on online TV. I subscribe to Sky Sports and Movies via Virgin Media, but it would appear that I can’t watch them online because I’m not a Sky digital satellite TV customer. If this is correct it doesn’t seem fair! The great thing about online television is that you can switch the monitor off and just listen. I stared tuning in while catching up with admin on Sunday mornings. Andrew Marr is much better without the pictures. Beware if you are thinking of buying one of these! I bought one and a router to watch bbc iplayer on my TV. It was great at first but now it won’t load the correct iplayer page and after visiting various forums, it seems no one knows who is to blame for this problem. It’s been a disappointment to say the least! Guided by the Which? appointment of the tv as a “best buy” I bought a Samsung LE32C650 about a year ago. I was particularly keen on the internet@tv facility. Its an excellent TV with bright, clear picture, good EPG and easy-to-use remote. There is a BUT however with the internet@tv facility. Using the BBC i-player can be a very frustrating experience. In the course of watching an hour long programme its not unusual for the picture to freeze several times, often leaving the whole tv locked and the remote control ineffective. In these cases the tv eventually restarts itself, but the implementation of i-player means it doesn’t remember where you got up to, nor can you move the progress slider to pick up from where it went wrong (as the pc version does). You have to ‘fast forward’ (actually fairly slowly). This often results in me giving up altogether and watching i-player on my pc. The lack of interest shown by both Samsung and the BBC in the problem has been a real disappointment, as the problem seems not to be unusual judging by comments on various websites, including the BBC’s own i-player forum. However the cheap and much better option is free-sat which has been around for ages and if you pay £600 – £1500 for a TV and a humax box recorder then £100-£150 for a sat dish is the pretty obvious thing to do. If you are on the internet then home-plugs for every expensive TV and you have internet TV as well. Sky TV may be for people with loads of money to waste but who knows why they pay.